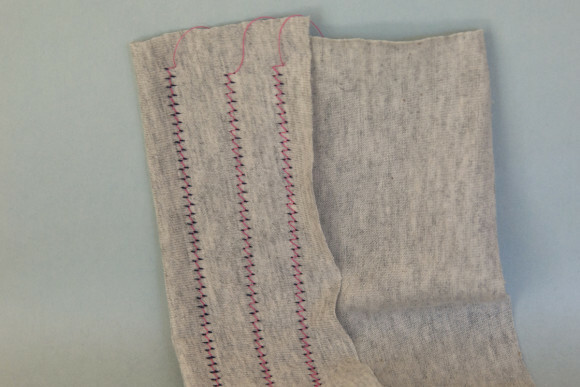 Our regular contributor, Shelley, is back today with some fantastic tips for twin needle hemming on knit fabrics. Let’s hear more from the lady herself. Have you made any garments for your kids, or yourself, using knit fabrics? There’s been lots of inspiration for t-shirt sewing recently and I’ve realised that a lot of the tutorials and pattern modifications that I’ve shared here in the past have involved knit sewing. Today I want to tell you the story of my history with twin needle hemming. It’s part sewing evolution story, part cautionary tale and hopefully a bit useful. Please feel free to share any tips or tricks you might have as well in the comments below. 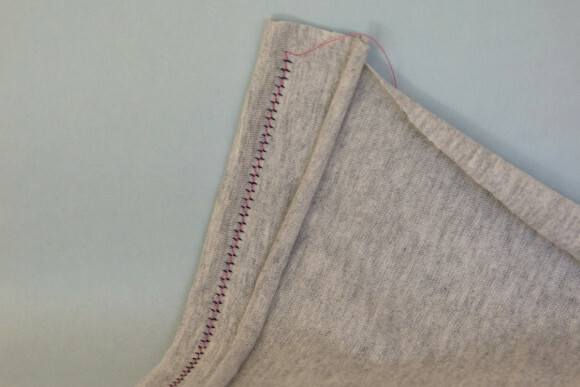 When I first started to sew knit garments for my kids I used a zig zag stitch on my hems, or experimented with a sewing machine lettuce hem and I was happy. For the most part. But I dreamed of a knit hem that looked like the shop bought t-shirts. I heard about twin needles and set off to find out if my sewing machine could use them and to buy one. I was happy to learn that pretty much any sewing machine can use a twin needle and so I purchased one. Just one twin needle for a beginner. I went home and immediately broke my new twin needle as my sewing machine was still set in zig zag mode after constructing my t-shirt. First lesson learned. Twin needles come in various widths and needle types. I probably only need to have the stretch twin needles, but I confess to being a bit blasé about needle types, hence that Universal one has snuck its way into the collection. I tend to use a 4mm twin needle for kids garments and a 6mm for adult garments, purely because that’s what looks about right to me. Although perhaps not quite right from the back. It was only after a couple of wears that I noticed the kids were breaking the hems. The bobbin thread was snapping when stretched and the needle threads all “popped.” I realized that for the hem to stretch the bobbin thread needed to zig and zag more in order for it to have the potential to lengthen. 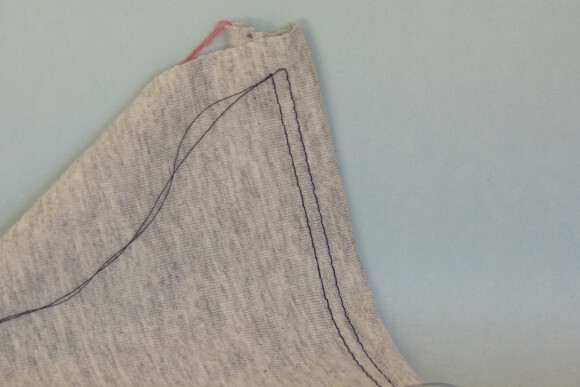 When the needle threads appear on the underside of the fabric like that, the sewing machine manual will tell you to increase your needle thread tension. So I did. The problem with increasing the needle thread is that, while the bobbin thread zig zags nicely, the needle threads draw together and the double hem ends up creating a tunnel effect. Here are the same three hems seen in profile. The increased needle tension gives this lumpy seam finish seen on the right. Now, that happens with shop bought garments too, but I wasn’t satisfied with my lumpy one-wear-hems. I posed the question of what to do on the forum and Liesl introduced me to Woolly Nylon. Woolly Nylon is a multi-filament nylon thread that is wonderfully strong and has a bit of stretch to it. You’ll find it in a few colors, but you can probably get away with just having one cone each of black and white, or perhaps even only grey. By using woolly nylon for the bobbin thread you get a stronger, stretchier double hem. However, the woolly nylon has more “drag” than a normal thread, so the tension problems were exacerbated. I figured if I couldn’t raise the needle thread tension any further, and I didn’t want to anyway because of the tunneling, I’d have to lower the bobbin thread tension. How you do this will be different for every machine, but I’m sure it’s achievable for every machine. I imagine there are fancy machines out there with bobbin tension dials. If you have one, then lucky you. 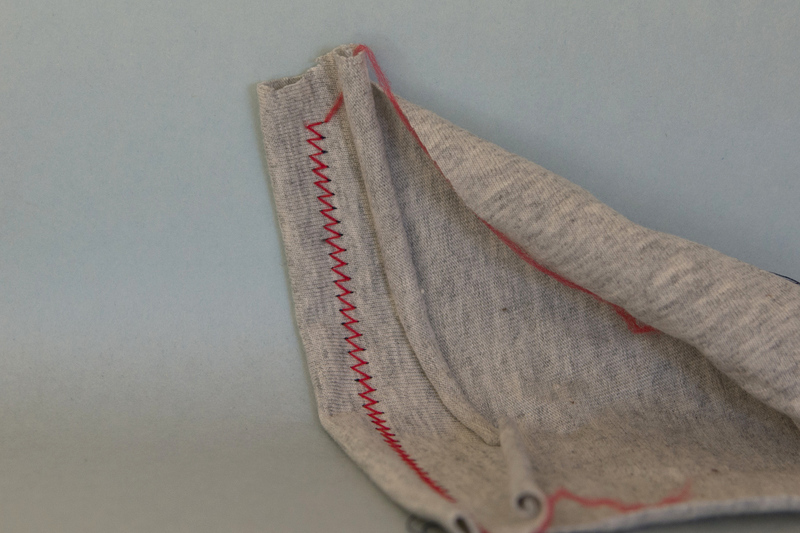 Dial down your tension, sew your hem, then dial it back up for regular sewing. When you remove the footplate and take the bobbin casing out you’ll see a little screw that can be adjusted to change the tension. I was a bit wary of fiddling too much with the screw, as I worried I might not get it back to a good setting for regular sewing. So I made a small financial outlay for a second casing. That one I dialled all the way out to “super loose”. Thankfully, my new super loose bobbin casing doesn’t have the red arrow of my original, so I can tell them apart. A bit of nail varnish or correction fluid would work to mark which was which had they looked identical. And now I could sew a nice, flat, strong and stretchy twin needle hem. You can see here that I’m using a cotton lycra with its notoriously curly edge. It’s a great fabric for sewing kid’s clothes, but trying to hem the unfinished edge can be a nightmare. At this point in the story I was hooked on sewing knit garments for my kids (no ironing!) and I was now the happy owner of an overlocker. 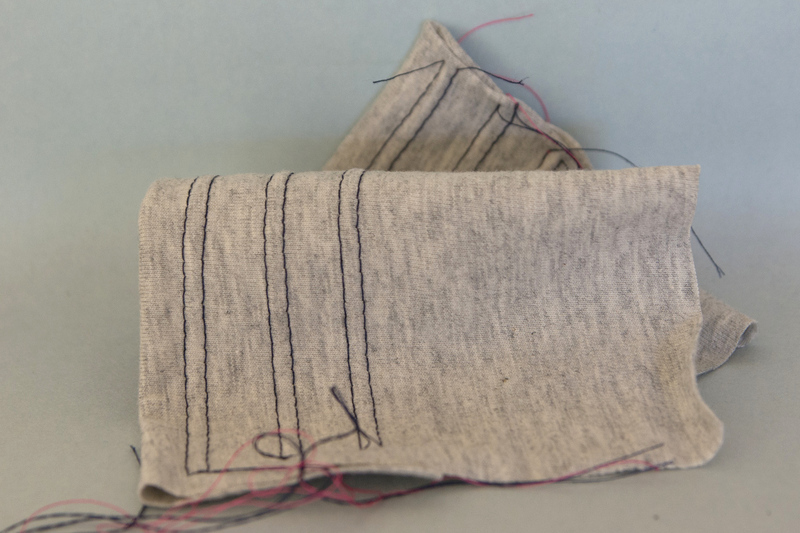 Finishing the fabric edge with the overlocker makes it lie flat, behave itself better, and adds some stability to the fabric to help prevent the dreaded tunneling. I thought I had twin needle hems licked and then I started to sew more for myself. What was working on cotton lycra was not working with lightweight jersey fabrics. 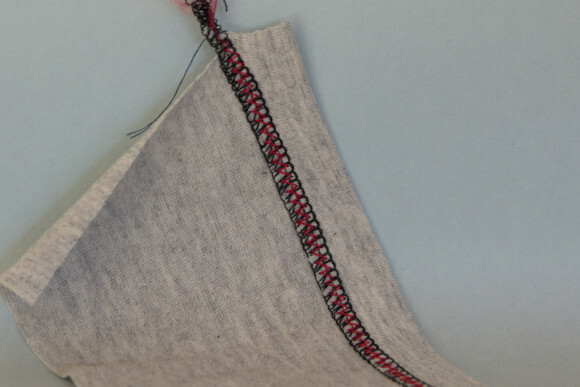 To prevent tunneling when sewing a lightweight knit fabric you’ll need to stabilize the fabric further. Overlocking helps, but a thin strip of knit interfacing, fusible webbing, or a wash away hem stabilizer will do wonders. Where maintaining the fabric’s full stretch is crucial, the wash away hem stabilizer will be the best product for the job. Buy bigger sheets and use a ruler and rotary cutter to cut it into 1/4″ strips to make it cost effective. Here’s a rayon jersey that’s hemmed with my final “perfected” twin needle hem on the left, and then again on the right, but this time with a thin strip of stabiliser underneath. 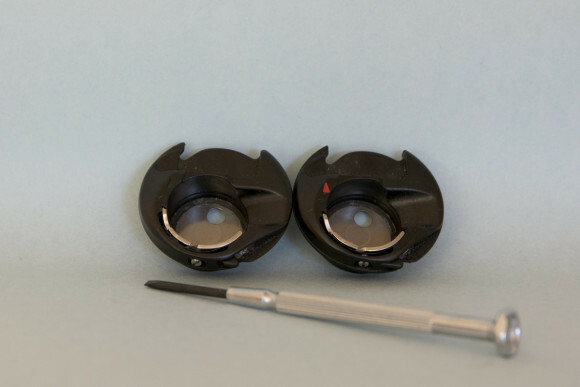 It takes me only a minute to swap over my bobbin casings and insert the twin needle. When I remember to, I also swap to a walking foot. This does help prevent the fabric getting stretched out as you sew, and stops me getting stuck on the side seam bumps. I’m not convinced it’s essential for hemming knits, rather it’s the icing on the cake. Sometimes the needle threads get a bit twisty and knotted together. If you’re going to hem a dozen t-shirts in a row, you may have to stop and rethread your needles half way through. I’ve definitely noticed that using cheap overlocker type thread for the needle threads leads to a hot knotty mess quite quickly. Stick to good quality threads up top. Does it make any difference which direction the two needle threads unwind in? I honestly don’t think it does. But, if things are getting knotty, you won’t do any harm in flipping over the second thread spool. I never remember to make a note so I can record any statistically significant difference…. I’m happy to say that when I rummaged through my kid’s wardrobes to find a t-shirt with a “popped” hem to take a photo, I couldn’t find any. They’ve all been outgrown and handed on now and become someone else’s mending problem! Thanks for this article – I’ve also had the problem with my kids popping the hems of their shirts! So frustrating. I’ll have to try out lowering the tension on the bobbin thread. I was just looking on Amazon and they actually sell a low-tension bobbin case for my Janome, specially marked with a little blue triangle. Thanks for this! 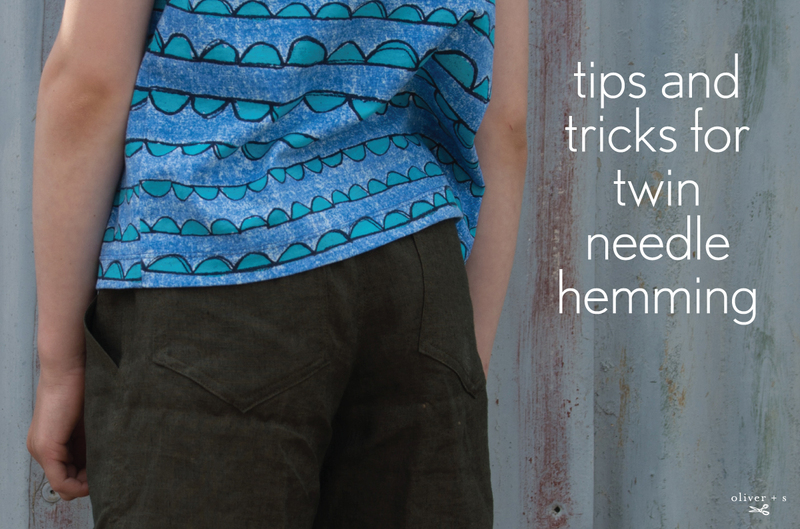 I’d trawled through the forums and have implemented many of these tricks with my double needle hems. I will say that for my machine, a walking foot is *essential* for working with the double needle. If I forget to use it, the leftmost needle thread drops stitches like crazy. Best advice is always do what worked last time! Thanks for the kind comment. All great tips. I got so frustrated with my machine (which hates doing any sort of zig zag on knits) that I finally got a coverstitch. But before I did that I did find that my machine much preferred having both the threads come off the two spools in different directions when using a twin needle. Otherwise I would get tangles. But this may just be my machine’s personal quirks. Ahhh- You might have just solved my problem- I have the two threads coming from ‘behind’ the spools, through the up and down tension- thingeemebobses, but the left thread (yep left’s not called sinister for nothing) ‘strips’ itself till it snaps. Thank you, awesome timing! I just bought a twin needle so I can hem the Maritime shirt I’m making for myself. I really appreciate reading all these tips before I try it out. Great! Glad to be of help, and I’m sure you’ll love the Maritime pattern. 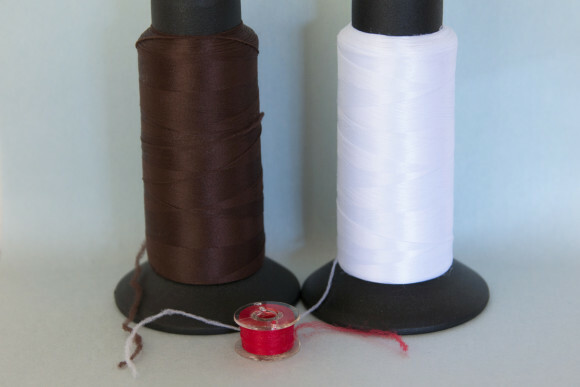 According to Nancy Zieman, the 2 thread spools should be unwinding in opposite directions. I tried it, no thread tangling! Great, glad to hear it works for you. We need a randomized, double blind trial of spool winding directions! 🙂 I flip one if I’m getting tangles, but I can say conclusively if it makes a difference for me…. Thanks for this very clear article. Good to have the info in one place. Shelley can you answer something for me please? I’ve seen that you should wind woolly nylon onto bobbins by hand, so it is not too tight… but how do you judge how loose/tight to wind it? Su, I just heard that a day or two after writing this article. I guess if you hand wind the bobbin it will be lower tension so you may not need the altered bobbin casing tension. I wind mine by machine. The big spools don’t fit on the machine so I hold the bottom of the spool, keeping my fingers clear of the thread, and hold it horizontally as if it were on the machine. Leaving this here for future readers – I found out the hard way today that if you thread your bobbin by machine with this stuff, you should use a metal bobbin! I should post a picture somewhere – my popped, expanded plastic bobbin is pretty impressive. Wow, Enbee, that’s crazy! I haven’t had that happen with plastic bobbins (yet?) and my machine certainly doesn’t like sewing with metal bobbins. 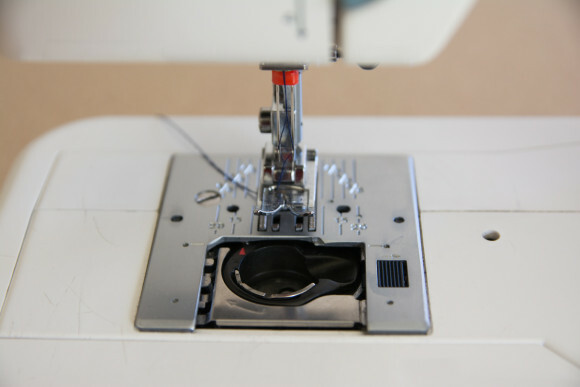 When the salesperson asked me what machine they were for- she warned me that the newer machines have a magnet underneath the bobbin case and when you use metal bobbins that upsets the rhythm of the stitches with the results to follow. So it’s plastic ones for me now with slightly less thread on them to avoid snapping. I fooled around with the double needles with similar frustrations, and then I found out about the coverstitch machine. Bought one by Brother that is a breeze to thread. 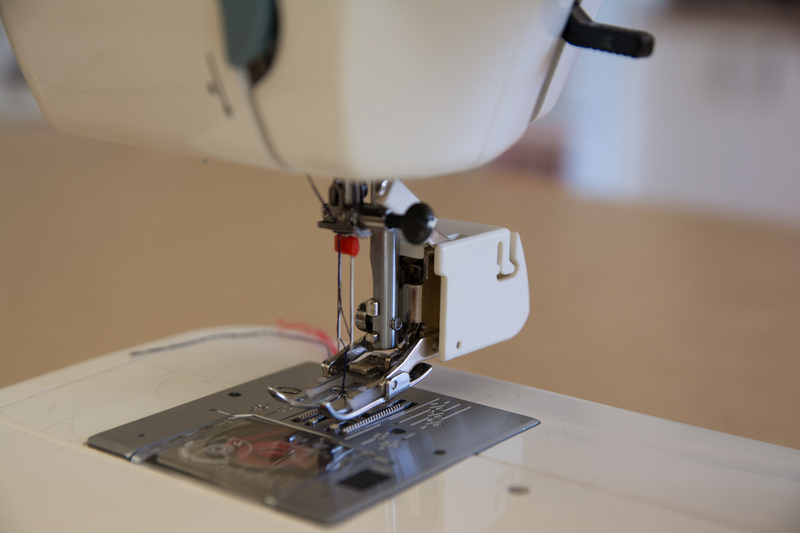 Its wonderful to have a machine dedicated to the double stitch look and not to have to make all those adjustments. I enjoyed your article anyway! Wooly nylon thread has just been added to my shopping list. Great article Shelley. You always make me laugh! Great post, Shelley. I’m all too familiar with the ‘tunnel’ effect… definitely going to try that stabiliser tip! Thanks Shelley! I’ve been looking at my kids’ popped hems. Now I know what to do next time. I hope it helps Renee. I no longer mind so much if my kids tuck their knees up under their t-shirts! Great post, Lightning. I flip one of my spools when I double-needle hem and have found that it really does help to prevent tangling. Looks like the flipping advocates have the numbers. I’ll have to start paying more attention to my methodology! I’m unclear on something. 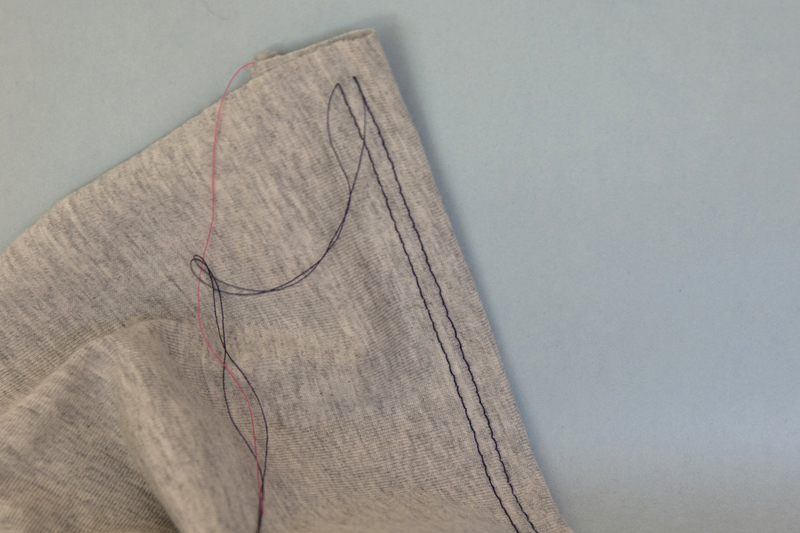 If I need a stretchy hem, will a regular twin needle using the straight stitch result in a stretchy stitch? 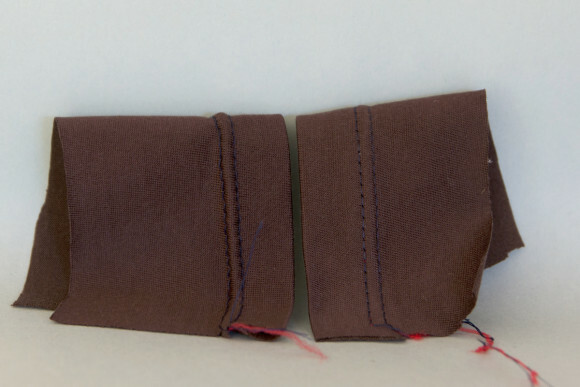 Or do you need a “stretch twin needle” for the hem to be stretchy? Thank you! Sarah the stretch comes from the zig zagging of the bobbin thread and it’s ability to straighten and lengthen when stretched. That happens regardless of what type of twin needle you use. The “type” of twin needle is more to do with the sort of fabric you’re sewing. A “stretch” or “ball point” needle is used for sewing knit fabrics to avoid damaging the fibres of the fabric and holes appearing along your seams. Thanks for the tips in hemming knits with double needle! I’ll have to definitively try the Woolly Nylon. Lots of great snippets! I’ve been struggling with mine and given up on my twin needle in a bit of a huff. Will try your suggestions! A universal needle is handy when stitching poly cotton or a polyester with slight give as it is between a sharp and a ball point needle. 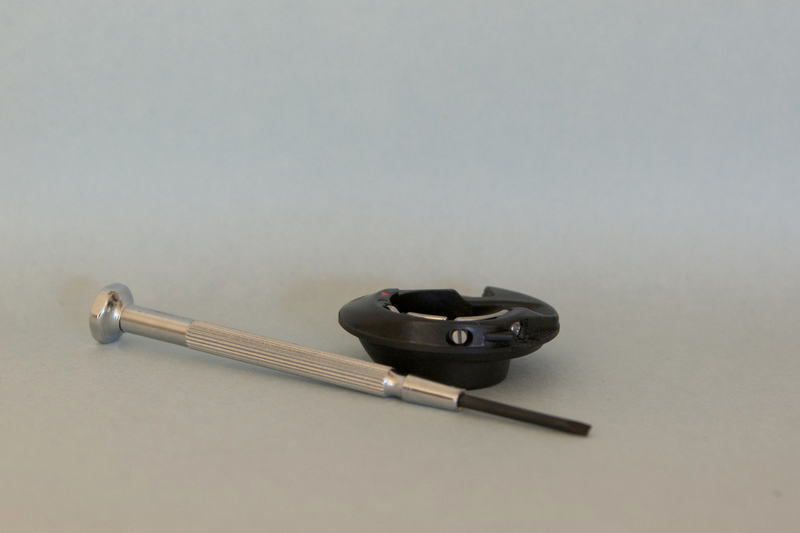 Wind woolly nylon onto the bobbin by slowing down the rate of winding if you have this feature available – not all machines accept metal bobbins. What brand of “walking foot” do you use? I just purchased a mid priced Juki and in the shop where I bought it, we tried two brands and neither one would allow the twin needle to pass through the bobbin plate. I do like your solution using the secondary bobbin case with a reduced tension. I’ve also used knit stay tape in the hem of stretchy fabrics prior to using the twin needles. But it still changes the lay of the hem line. I bet the walking foot would help this. What about using the stretch stitch selection with the twin needle and the walking foot?I have just begun to sew. will this tackle the problem of hem breaking? Question in regards to twin needles use as a top stitch/hem… I’m starting to get into top stitching neck bands and I can’t figure out how, if possible to make the top stitch two parallel straight lines and the bottom zig zag.. i know I need to get wholly nylon thread for my bobbin to help make the neckline stretch without breaking the thread but I swear I’ve seen ppl use that option but can’t seem to get any help from my owners manual. Help! Laura that is exactly what you get as soon as you use a twin needle: two parallel lines of needle stitching with the bobbin thread zig zag going back and forward underneath. Just insert the twin needle, thread both eyes, select a straight stitch and there you go. Everything else I’ve described is just tinkering to make it a more, durable hem. Good luck! I have used twin needles in the past, with good results. I now own a newer Janome and use a walking foot almost all the time. That happens to me with my walking foot too sometimes (also a Janome user) and I find it’s because the screw holding the walking foot to the bar comes loose after stitching for a bit. It never comes loose with the regular foot, so I always forget about it potentially happening. Could that be it? Have you tried cleaning out the bobbin case? take everything out and carefully remove the lint. I sew an awful lot and have to do this regularly to avoid skipping etc. Thank you! I found your tips and bought another bobbin casing, something I would never have thought of. It took me quite some time to find a good balanced stretchy hem. But it worked in the end! Your article is the only one that discusses technical problems with the twin needle in such depth. I am so glad you took the time to write it down! Thanks Jos, that comment really made my day! I’m so glad you’ve got the double needle thing working for you now. hemming tool. I’ve ordered some of the texturized polyester thread to try out next. Update on my previous comment. I received the textured polyester thread and it appears to work similar to the woolly nylon. textured thread is available at a great price. I bought a cone of 8500 yrds for $3.00. Even at the usual price of $13.00 it’s probably the last time I’ll have to purchase it. That’s great to hear. I guess if you hot wash, or tumble dry garments then heat could be a concern. Nothing like sewing for your mum to increase the pressure! Glad you got a hem you were happy with. Oh good point Nicole. You’re right that backstitching or lockstitching will probably create a hot mess of tangled threads. I tend to use the woolly nylon bobbin thread to pull the two upper threads through to the wrong side of the fabric then I tie them either to each other in a square knot, or altogether with an overhand knot. Of course, if I’m sewing a hem I’ve come full circle and I have the starting threads (1 woolly nylon, 2 upper threads) as well as the ending threads (1 woolly nylon, 2 upper threads). I simply tie three against three with a square knot. Your article just made twin needles on knits infinitely easier for me. That’s great to hear Yvonne! Thank you SO MUCH for this. I looked all over for solutions to the non-zig-zag on the underside when using a twin needle and yours was the most clear. I had a spare bobbin case so I loosened that sucker a bunch and got a perfect ziggy zaggy with my woolly nylon thread and a great double stitching on top. Oh I’m delighted Gale. So happy for your success. Thanks! Hi Shelley, I’ve only just started experimenting with twin needles and was tearing my hair out when I came across your excellent article. My problem is that the right side of my twin needle works perfectly while the left side is just not catching the bobbin thread at all (or maybe 1 stitch out of 20 literally!) I have a singer starlet and phoned up singer who suggested using a schmetz instead of a klasse twin needle…. (could it really make that much difference???) Do you think a walking foot as per Enbee’s 16 February comment might do the trick? Or any other thoughts? I’m really keen to get going but feel at a bit of a stand still just now! Hi Kirsty….I’m having the same problem and I read another comment about having skipped stitches with the left side. So weird that it’s only (or mostly) with the left thread, isn’t it? Too late today to run to the store but tomorrow I’m going to get some wash out stabilizer, try loosening my bobbin tension, and using my walking foot. I’m also going to look for the wooly nylon for bobbin thread but I’ve never seen it. I’ll report back! Tough to say what it is, but you’ll probably need to do a little testing to determine what works best. You might need a different needle, thread, walking foot, etc. I’d suggest just trying one change at a time until you figure out what works best for your machine. Many thanks Kat, so frustrating isn’t it! I availed myself of all of the above with great results! I found Woolly nylon at a specialty sewing shop rather than one of the chain sewing shops (I’m in Australia) but I also saw it readily available online. I hand wound the woolly nylon onto the bobbin and must have wound it a bit loosely as I found I didn’t need to lower the bobbin tension. Hope things sort out for you! Very many thanks Liesl, for your helpful reply. I changed the Klasse twin needle I was using for a Schmetz and bought a walking foot. This combo seems to have resolved the issue! I’m so glad to have this resolved…I celebrated by sewing the Maritime top! I’m so pleased with it! Hearty thanks once again. Interesting…. 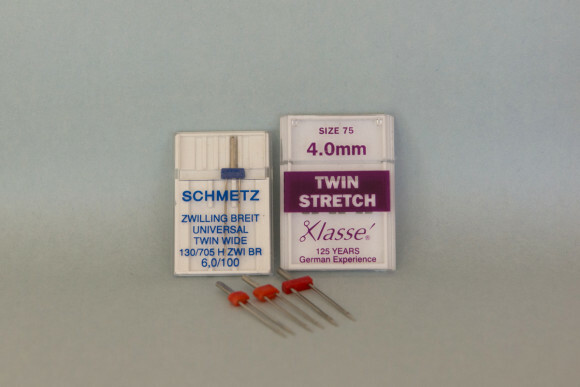 I just bought the Klasse twin needle…. wonder if I should of bought a schmetz now instead. Haven’t tried it out yet ( today’s job) also spotlight does have woolly nylon sometimes but it can be hard to find. There. I had to ask. In follow-up, today I got a new twin needle that was marked “stretch”. So I tried using that along with my walking foot and not a single skipped stitch! Oh, and I also loosened the tension on my bobbin cassette a bit. Oh that’s great news for both of you. I’ve always found that if and when the twin needle plays up it’s the left side too. Must be to do with the the way the needle and bobbin interact. A new needle has been the solution most times for me too. Good to hear you have lovely hems now! Wonderful post full of very helpful hints! Thank you so much! I’m having tunneling problems hemming a ready-made very stretchy lightweight piece of athletic gear. Tried a wash away stabilizer for embroidery that I had on hand, but it didn’t help, wondering if the type you mentioned is different. Think I will look into stretch interfacing, though I do wonder about maintaining the garments original stretch. This is such an informative article. Thanks so much! Thanks so much for this! I’m new to knits and looking to do a more professional hem. I just bought a twin needle (klasse) so we will see how it goes with my walking foot and woolly nylon in the bobbin (I have a husky). That’s today’s job. I really wish I had bought a overlocker with the cover stitch option now but at the time I was like ” no way will I be sewing knits!” I really don’t know what I was so scared of!!! Update… so with my twin needle I do get a lot of tunneling on my light knits and cotton Lycra. My sewing shop lady advised me to use a smaller needle ( I have a 4mm) so I am going to try a 2mm and a 3mm along with a second bobbin case that I can play with. Will let you all know how that goes. Today I will try tear away stabilizer for my hems 🙂 thanks again for this awesome article! I have tried all possible tension levels on my sewing machine, but I’m still having the tunnel effect. I have also tried applying stretch stabilizer, still problem not solved. Any ideas? Thank you for this post! I have experienced the exact same issues as you, and I’m hopeful that your solutions will work for me as well. Thank you so much for sharing! Always have problems with twin needle sewing. Will try your tips and see how it goes.